The Queen of Pre-Code. The Grande Dame of Dangerous Curves…and a awesome right hook. Way before Big Valley, Barbara Stanwyck was a force to be reckoned with on the Big Screen. Shortly after silent movies were out and Pre-Code (The Hayes Office dictating morality in Hollywood) came in, was a period where women and women’s stories ruled Tinseltown. Full of moxie, these hard-scrabble femme fatales, black widows and “loose” women tore through the screen to grab their audience by the throat…and heart. 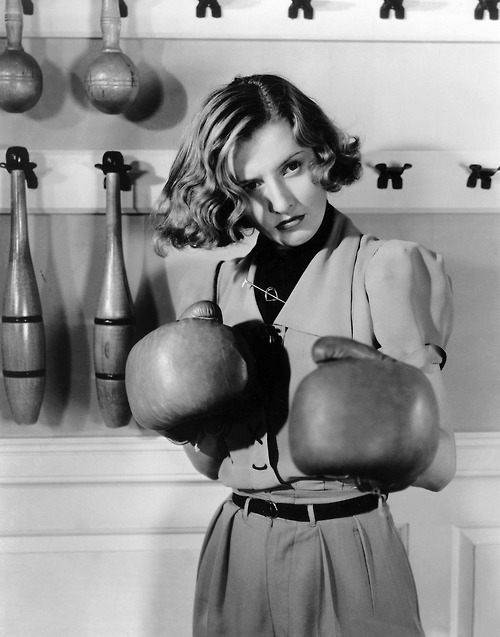 And none was as rough and tumble as Stanwyck. She was the definition of “hell hath no fury like a woman scorned” and Babs took no prisoners. From her earliest films, she was a force of nature, a broad with a mind of her own and more brains than all the men around her, combined. One of my absolute favorites was “The Furies” (Criterion Collection) about a rich, cattle farming family on a border frontier in the middle of a land-dispute with native Mexicans. But the real fight is between father and daughter Fury, played by Walter Huston and Stanwyck. Wow, this is one of my favorite movies that no one has ever heard of before. And Stanwyck won’t lie down for anyone here, let alone a man. She bests her leading men at everything…including eating the scenery. I just love it! You wouldn’t know it, but by the time The Furies was made (1950), Barbara had made 61 movies. Six-One, people!! Such classics as Baby Face, The Woman In Red, Stella Dallas, The Lady Eve, Meet John Doe, Double Indemnity, The Strange Love of Martha Ivers, Sorry, Wrong Number; the list goes on and on. I love Barbara Stanwyck because she played women who would eat me alive. Women you couldn’t possibly help but fall in love with, right before they vanquish you. You know the type I mean. And if you don’t then watch some of her movies and you’ll get what I mean. The kind that give as good as they get, never give up without a fight and will stand by their man and family no matter what. Cross them at your own peril. That goes for loving them, too. But if you do manage to find your way into their heart, the intensity of their love and affection for you will make you feel ten feet tall. In real life, Barbara Stanwyck was considered a lesbian about town in Hollywood and has become somewhat of a gay icon. But any attempt to label her by such categories diminishes in comparison to the animal magnetism Barbara exuded on-screen for all audiences, whether they be male, female, gay or straight. Barbara was infinitely watchable because she was confident and at home in her own lovely skin. Such a master of her craft and profession, her credit role has break-out role after break-out role, even after The Hayes Code made it hard to portray a modern woman taking life on her own terms and bowing down for no one. Barbara was a firebrand both on and off the screen. But she was also extremely loyal and once you became her friend, you stayed one for life. I could go on and on about how much I admire Ms. Stanwyck, but time better spent would be renting one of her movies – like “The Furies,” and bracing yourself for one hell of a wild ride. You won’t be disappointed. And you may just fall in love with her like I did a long time ago. Just remember never to turn your back on her.